Basically, it's the ultimate Air Guitar. It lets you play lead guitar riffs on top of well-known songs. There are cartridges that store songs and riffs in ROM; each cartridge contains five songs, a few digitized instruments, and dozens of riffs. The riffs are selected by holding down a fret button with your left hand and tapping one of the string buttons with your right hand. It will then play a lead guitar riff that is harmonious with the selected song. There are also drum pads and a small keyboard if you want to spread your talents around. The note pitches are predetermined by the song as are the durations, but when they are triggered is up to the player. One can create some remarkably complex patterns by hopping between two riffs. We wanted to ensure that the user didn't feel like they simply and idiotically pushed a button every now and then. One thing we blew, though, was not having a balance control between the background music and the riffs; sometimes the solos get lost in the sauce. Here's how to play a Jaminator and learn all the hidden tricks. 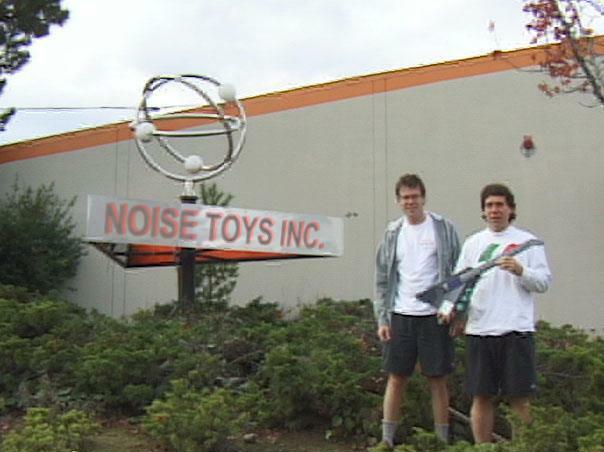 The Jaminator was created by three of us at Noise Toys Inc. (NTI) in 1990 for Worlds of Wonder, Inc. (WOW). The three of us are Steve Capps, Ray DuFlon and Ed Bogas. NTI has both a patent on the Jaminator (U.S. Patent No. 5,074,182) and a registered trademark for Jaminator. Worlds of Wonder is a long defunct, hi-tech toy company that was famous for Teddy Ruxpin and LaserTag. Unfortunately for us, WOW went Chapter 11 before they could become famous for the Jaminator. There were over 100K Jaminators made, some of which were dumped into the surplus market overseas. There were six cartridges produced: Classic Rock I, Classic Rock II, Lead Guitarists, Modern Rock, Hard Rock I and Hard Rock II. Here is a list of all the cartridges produced. The industrial design is cool and was done by the folks at IDEO. We advocated that it just be a guitar, but the WOW folks and others insisted it have the added keyboard and drums. The jury is still out on that one. After that, a small Japanese company, Arrow Micro-Techs, picked it up for licensing in Japan. They struck a deal with Yamaha and it was sold in Japan during 1993-4. It was priced too high and didn't do particularly well. They made a bunch of new cartridges: Deep Purple, Eric Clapton, Jeff Beck and a few with Japanese pop music. © 1999 Noise Toys Inc. Jaminator is a registered trademark of NTI.